Do you think this could blur the difference between RAM and storage? "The folks at BiTMICRO are about to blow some doors off of the SSD truck with a new product they'll be showing at CES this year. According to a press release, the company is introducing a new, 2.5-inch solid-state drive with a whopping 832GB of NAND flash goodness. The SATA II (3Gbps) drive is a new addition to the company's E-Disk Altima line, and utilizes a technology the company calls multi-level cell (or MLC) memory, which apparently doubles the number of bits stored per memory cell when compared with single-level cell (SLC) NAND. The drives are expected to ship Q3 2008 in capacities ranging from 32GB to 832GB -- and you can be sure we'll be staring intently at them (and asking for demo units) as soon as CES rolls around." The future of storage is solid state, and BiTMICRO Networks, Inc. brings you the most advanced flashdisk solution with the E-Disk® Altima™ series. Powered by BiTMICRO's proprietary EDSA™ and LUNETA™ ASICs, E-Disk® Altima™ flash-SSDs utilize high-density flash memory chips to create massive storage capacities in standard disk drive form factors. What's more, flash memory-based E-Disk® Altima™ flash solid state HDDs boost system performance by eliminating seek time and latency for faster I/O and sustained transfer rates. With no moving parts, E-Disk® Altima™ flash-SSD set the bar for storage reliability, durability and endurance in all types of operating environments. BiTMICRO Networks E-Disk® Altima™ SATA flashdisk products offer optimum solution to address ever growing storage capacity requirements and performance demands of today's computing applications. It is designed without device driver requisites, making it easy to install and operate. 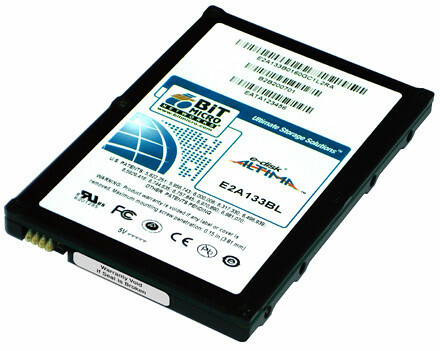 Armed with patented FlashBus™ technology, E-Disk® Altima™ SATA flash solid state HDD offers random I/O rates of up to 20,000/sec, burst rates of up to 300 MB/sec, sustained rates of up to 100 MB/sec, and storage capacities of up to 416 GB. Will many banks allow you to secure a mortgage against that to actually make it possible to buy one? I wonder how thick the 832GB model is if the most they've managed to fit in an 8.5mm thick standard drive size is 64GB. This is the picture shown at the site. In moderate quantities, a 32GB NAND chip is $25. So the component cost of 832GB is going to be at the most $650 -- probably less since they're undoubtedly getting a better price. The enclosure and drive electronics don't add too much extra cost. I think they could sell the 832GB drive for between $1000 and $2000, depending on how much profit margin they determine is optimal.